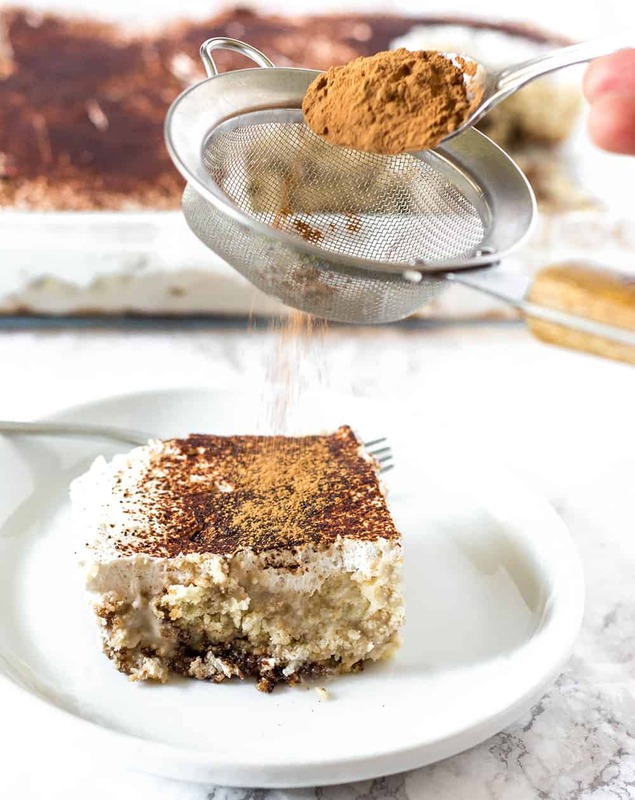 Amazing Vegan Tiramisu is my version of the classic Italian dessert that is creamy, pillowy soft, with rich bold flavors. It is not only vegan but also gluten-free, alcohol-free and caffeine free. 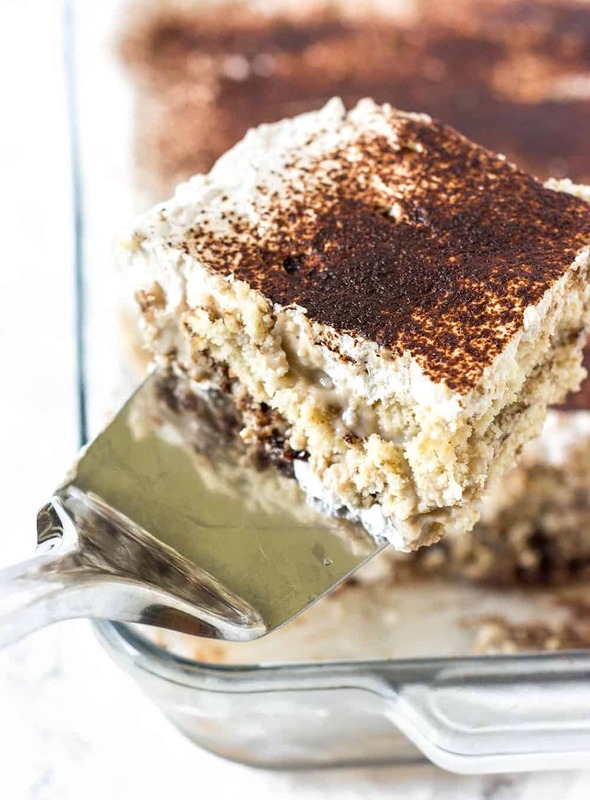 Years ago, I always made Vegan Tiramisu for my family and for special occasions until I got sick and tired of making it. Recently, I decided to make one on the final day of my cooking classes as a treat for the students. My students requested that I shared my recipe and I promised them that I would share it on here. 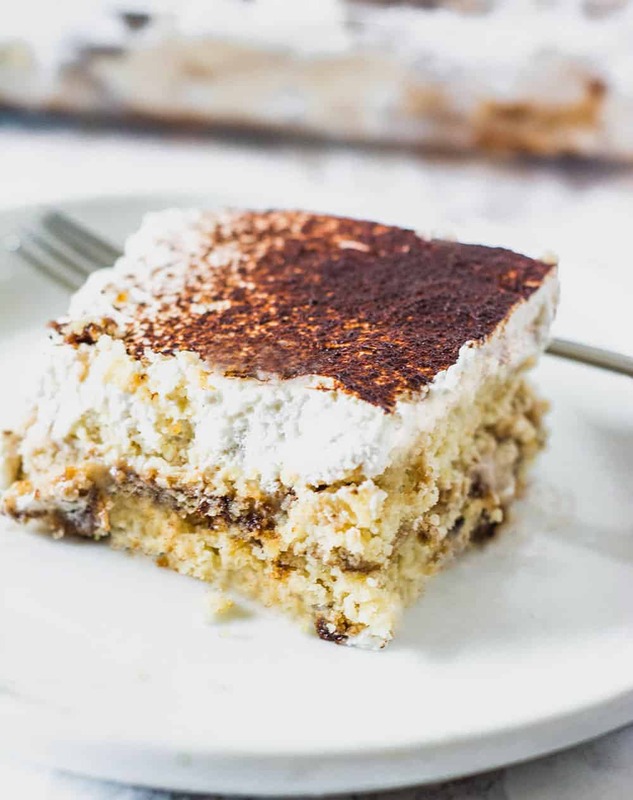 Traditional Tiramisu is an Italian dessert with layers of sponge cake that are soaked in coffee and brandy or liqueur with powdered chocolate and mascarpone cheese. 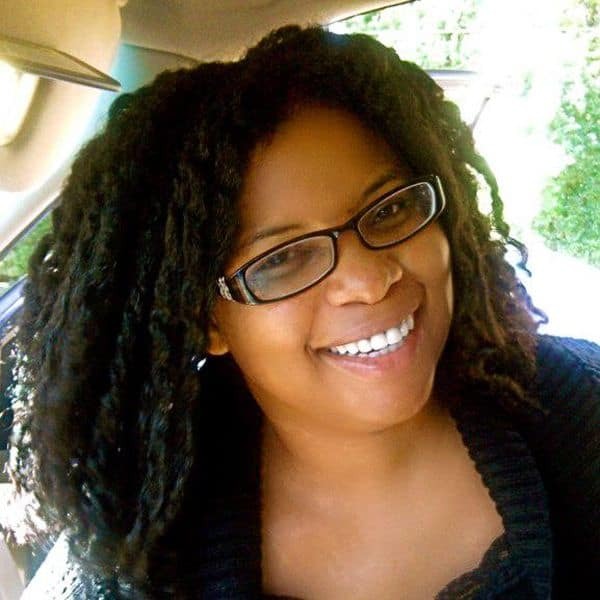 I decided to go the unconventional route because of my lifestyle choices. I don't drink alcohol nor eat dairy, nor caffeinated drinks. So I made a dairy-free, gluten-free, alcohol-free and caffeine-free version that will knock your socks off your feet. To make Vegan Tiramisu, first I made a fluffy vegan and gluten-free cake. I used my tried and true Vegan Gluten-Free Cake Recipe in a sheet pan. While the cake was baking, I prepared a thick and creamy vegan mascarpone made with almond milk, coconut milk, cornstarch, sugar, and vanilla. I also prepared a 'chocolate' style syrup made with carob powder. You can add about a tablespoon of your favorite coffee substitute as well. I also prepared a coconut whipped cream for the topping, So Delicious Dairy free CocoWhip is a great substitute for homemade coconut whipped cream. I allowed the cake, vegan mascarpone, and syrup to cool completely before I layered them. I used a 10x15 glass casserole dish for layering the tiramisu cake. Preheat oven 350 degrees F. Line and lightly grease a large sheet pan with parchment paper and set aside. I used a 12x18 pan. In a large bowl, combine brown rice flour, almond flour, sugar, baking powder, and salt. In a medium bowl, stir together, almond milk, ground flaxseeds, coconut oil, vanilla, and almond flavor. 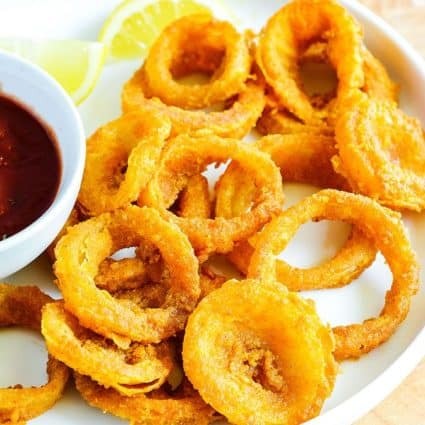 Pour liquid mixture into dry and mix to combine until batter is smooth and creamy. Scoop batter into prepared pan and bake for 20-25 minutes or until a toothpick inserted into the center comes out clean. Remove cake from oven to a cooling rack, keep in the pan until completely cool. Place almond milk, coconut milk, sugar, cornstarch, vanilla, almond flavor and salt in a blender and process until smooth. Pour mascarpone into a saucepan. Heat sauce on medium-high and stir constantly until thickened, smooth and creamy. Remove from heat and allow to cool. Place cold water, carob powder, sugar in a medium saucepan. Whisk until smooth and there are no lumps. Transfer saucepan over medium-high heat and bring to a boil whisking constantly. Reduce to simmer until slightly thickened, about 5 minutes. Add vanilla, almond flavor and salt. Allow syrup to cool. Remove chilled coconut milk from the refrigerator, open can and carefully drain clear liquid from the top of the can. You can reserve this clear liquid to add to your curries or smoothies. Scoop out the thick coconut cream into the bowl of a chilled electric mixer. Beat coconut cream until fluffy on medium speed until stiff peaks form, about 5-7 minutes. Add sugar, vanilla and whip to combine. Using a 10x15 glass pan, brush the bottom with carob syrup to coat. 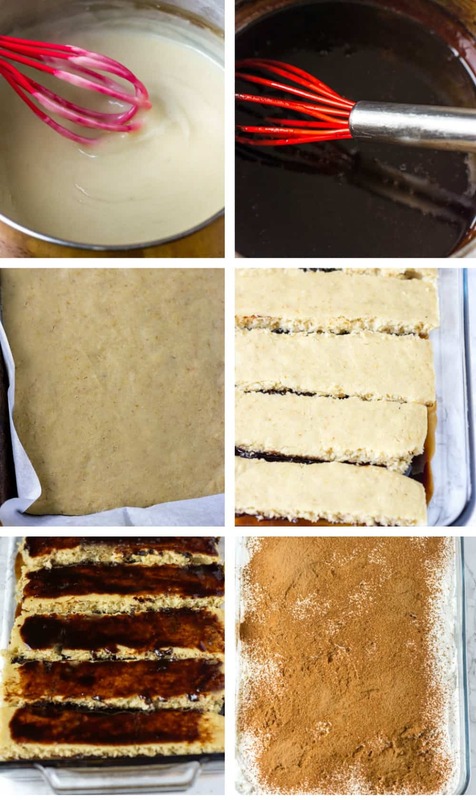 Cut cool cake into strips and lay in a single layer over carob syrup. Then brush cake strips with carob syrup. Scoop a vegan mascarpone over cake layer and spread to cover. Top with remaining cake strips, then brush with remaining carob syrup. Spread with coconut whipped cream to cover and sprinkle with carob powder. Keep refrigerated. Thank you so much for the recipe. I am following a paleo diet. 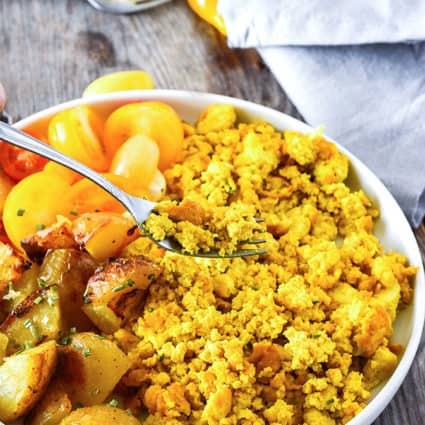 Is there anything I can substitute the brown rice flour with? Perhaps buckwheat flour? Pavla, I have only tried it with brown rice flour so I’m not sure if buckwheat will work, I just purchased cassava flour so this could be another option. Could I substitute cocoa powder in place of the carob powder? Regarding the 1 cup coconut milk in the Vegan Mascarpone – is this canned or carton (diluted) coconut milk? This cake is the bomb.. tastes amazing. Love the textures… this is a treat. Philly I’m so happy you love it. It is so amazing! Thank you for your feedback. This looks like a lot of work but for Tiramisu, it’ll be worth it. What can be substituted for corn starch? I have a mild allergy to grains, especially corn. Would tapioca starch work? Annie, you can make it the day before you plan to serve or make parts of it ahead of time. It is most definitely worth it. You can substitute the cornstarch with tapioca starch or arrowroot. Hope you enjoy. You are welcome, I hope you and the members enjoy it and have a sweet fellowship. I made this cake yesterday, using a regular vegan vanilla cake as a base (we are not gf). Also I made a very strong coffee instead of the carob syrup, everything else was the same. Delicious dessert/cake, I will make it again. New dessert recipe for my family. Thank you for this wonderful cake! Lariza, wow I’m so happy you enjoyed it and make it your own. Thank you for your feedback. This tiramisu looks delicious! I thought I had to give up one of my favorite desserts when I stopped eating dairy… thank you for this recipe! Pinning to try soon! Oh goodness, I love tiramisu and to find one that is dairy free is HUGE! Thank you, this will be added to our meal plan for an upcoming party. This looks fluffy and wonderful. It’s been too long since I’ve had a good tiramisu! Hi, this looks so wonderful. 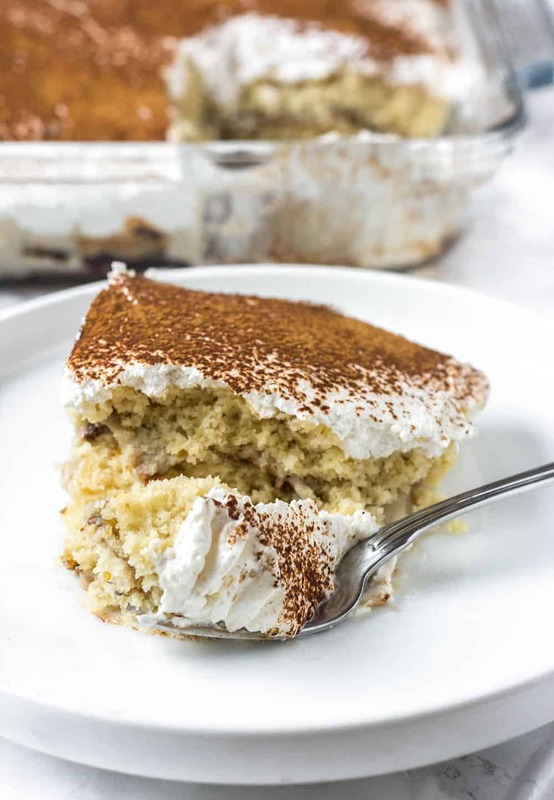 Our family is from Italy and I honestly have never had Vegan Tiramisu but it looks fabulous in your pictures! I love that you have made a wonderful traditional dessert into a more healthy Vegan choice. I might just have to try this out on my Mother and Grandmother to see what they think of the Vegan version. I’m just going to let them try it and not tell them any different. That way I get a more honest reaction. I really enjoyed this recipe though and definitely will let you know what everyone thinks. 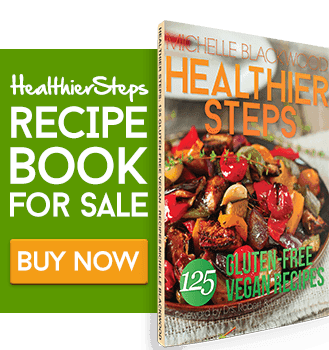 I love this recipe, I love the fact that it is alcohol-free! 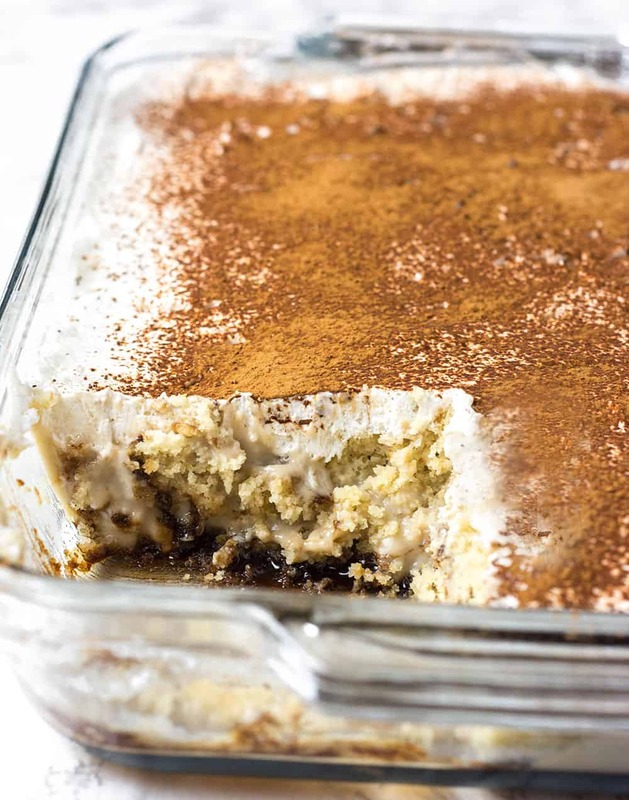 this tiramisu looks fantastic I love that it is healthy and I could eat the whole PAN! lol I never thought to use carob powder great choice!